Michigan State University is currently seeking a Psychologist! The candidate chosen will provide direct service and outreach to a diverse student population. 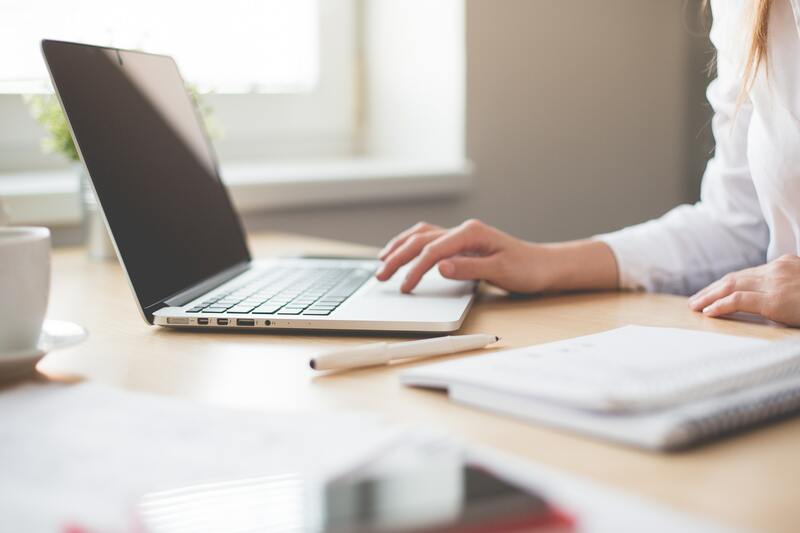 To be considered for this position you must have the following qualifications: Experience in brief psychotherapy and crisis intervention; experience in training and supervision; one-year post-doctoral internship; and more. To see the full job description, list of qualifications, and to apply, click here. Masters in social work is preferred, three years experience and social work license is required. The Michigan State University College of Social Science is looking to hire a Chairperson for the department of Human Development and Family Studies (HDFS). A doctorate and leadership experience is required. For more information on the position and to apply, click here. 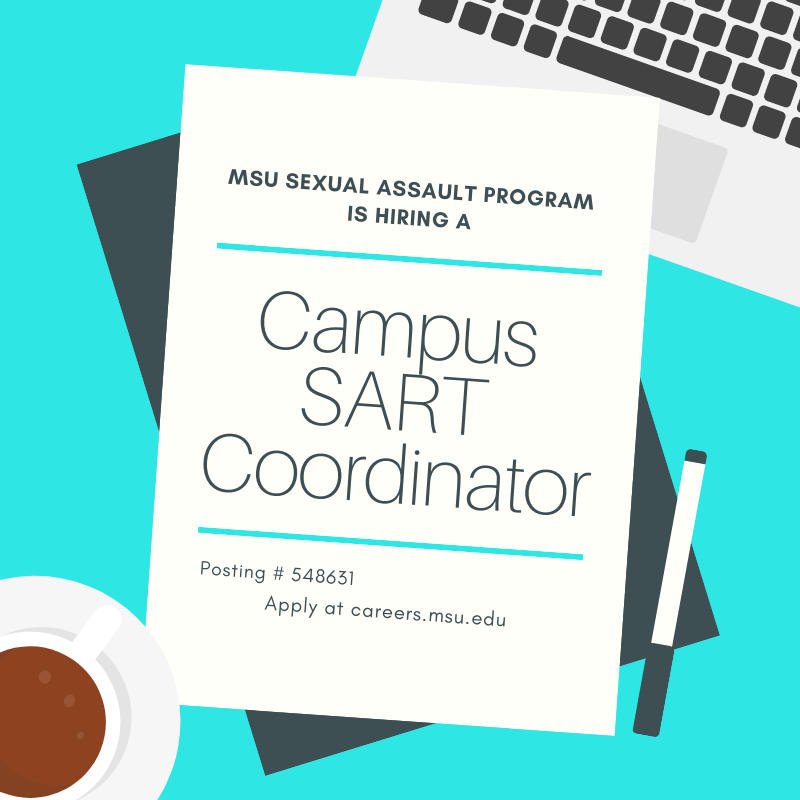 MSU is looking to hire instructors as a part of the School of Social Work. Their are 2-3 positions and the selected individuals will instruct courses on the practices of social work. A Master’s in social work and two years of experience is required. 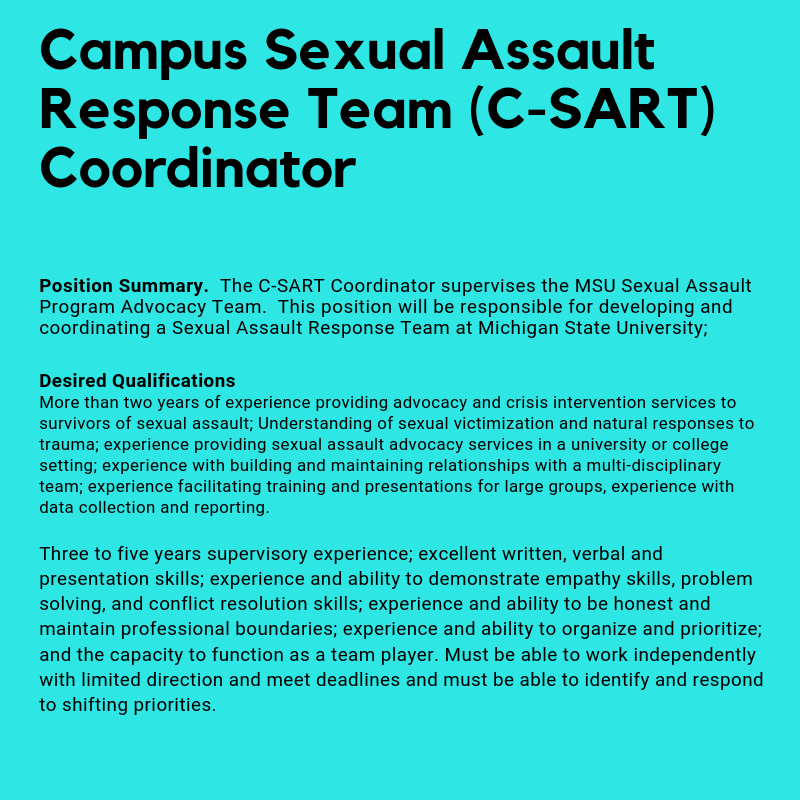 The Michigan Coalition to End Domestic & Sexual Violence (MCEDSV) is looking to hire a Technology and Administrative Specialist. Here is how they describe the job: As the technology and administrative specialist, you are responsible for the management of all technical facets of the programmatic side of the organization, as well as provide management of the day-to-day functionality of the office. This position is also responsible for the delivery of solutions around office technology and equipment- servers, desktops, laptops, networked printers/scanner, mobile devices, projector, website, user instruction, etc. For more information on this position and to apply, click here. Turning Point in Macomb County, Michigan is seeking a Domestic Violence/Sexual Assault Therapist/Shelter Children’s Specialist. This position will work as part of a team providing emergency and supportive counseling and services to adolescent and child survivors of domestic violence and sexual assault residing in shelter, and/or Turning Point’s Community Advocacy Program. Hospice Compassus is looking to hire a social worker in Saginaw, MI. As a social worker at Compassus you will be responsible for helping patients and their families reach their maximum level of coping. Requires Master’s degree or Bachelor’s degree with experience. A school in Farmington Hills Michigan is looking to hire a full time psychologist. Candidates must have a Master’s or Doctorate Degree in psychology and a Michigan state psychology license. Safe Haven Ministries is looking to hire a full-time Residential Family Advocate. Safe Haven is a nonprofit and is focused on aiding victims and survivors of domestic violence. The chosen applicant will provide advocacy services to resident and residents children. A bachelor’s degree is required for this position. For more information and to apply, click here. Safe Haven Ministries is looking to hire a full-time Bilingual Family Advocate. Safe Haven is a nonprofit and is focused on aiding victims and survivors of domestic violence The Bilingual Family Advocate will be responsible for providing services to survivors of domestic violence. They will also be responsible for providing translation and interpretive services. A bachelor’s degree in social work or related field is required. Written and oral fluency in Spanish is required. For more information and to apply, click here. Michigan Coalition to End Domestic and Sexual Violence is hiring sexual assault hotline staff! If you are interested in applying, email your resume and cover letter to Sarah.Proutrennie@mcedsv.org. LGBT and minority candidates are encouraged to apply.